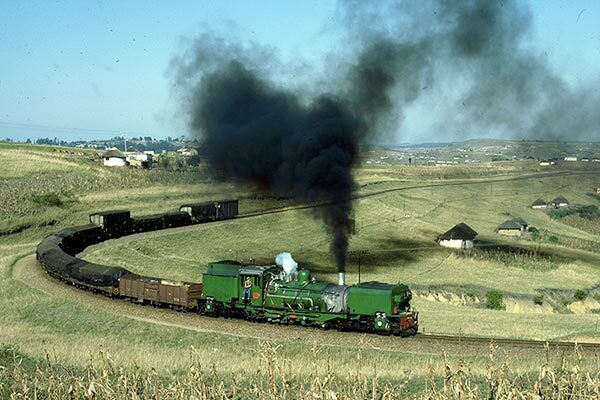 Caption - South African Railways (SAR) two foot gauge NGG16 class Garratt no.110 is seen after leaving Izingolweni for Harding on the top section of the line that started on the coast at Port Shepstone where there was a freight transfer facility from the main line. This loco was one of the second batch of locos in this class and was built in Manchester by Beyer Peacock in 1939. In June 1981 it was the only 'baby' Garratt sporting a green livery, which was not to everyone's taste! All the locos on this line faced uphill to Harding and it can be seen that a fair amount of freight was still being carried.